Explanation: Today, the Sun crosses the celestial equator heading north at 11:44 UT. Known as an equinox, this astronomical event marks the first day of spring in the northern hemisphere and autumn in the south. It also marks the beginning of Norouz, the Persian (Iranian) new year. Equinox means equal night. With the Sun on the celestial equator, Earth dwellers will experience nearly 12 hours of daylight and 12 hours of darkness. Of course, in the north the days will grow longer, the Sun marching higher in the sky as summer approaches. 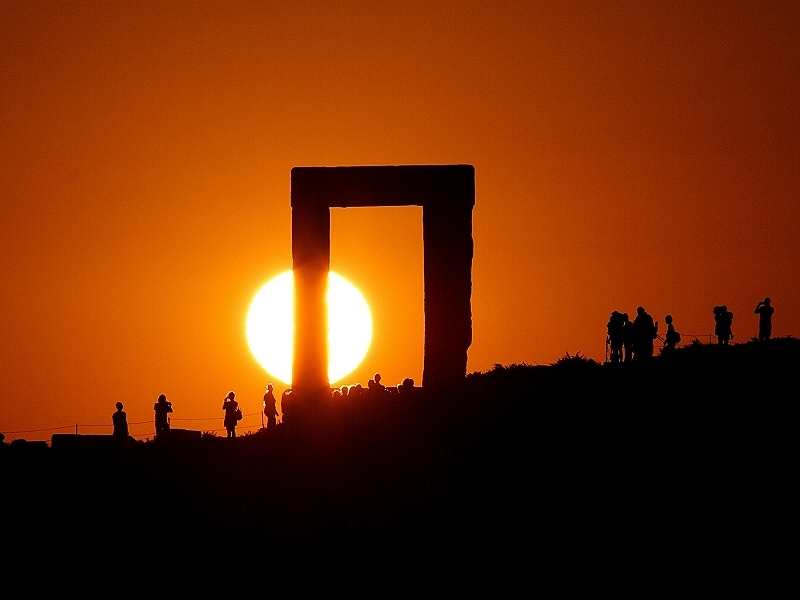 To celebrate the equinox, consider this scenic view of the setting Sun from the island of Naxos in the Aegean Sea. Recorded last June, the well-planned image captures the Portara (big door) in a dramatic silhouette. Measuring about 6 by 3.5 meters, the Portara is the large entrance to the Greek island's ancient, unfinished Temple of Apollo.